Recently Chris developed a sensitive area on his back. His skin would tighten when we pet him in a certain area. At first, I thought it was like that weird nerve on a dog that causes him to lift his hind leg when you scratch his back but then it started seeming like touching that spot was causing him pain. We didn’t see anything obvious but there was a slight bump under his fur. 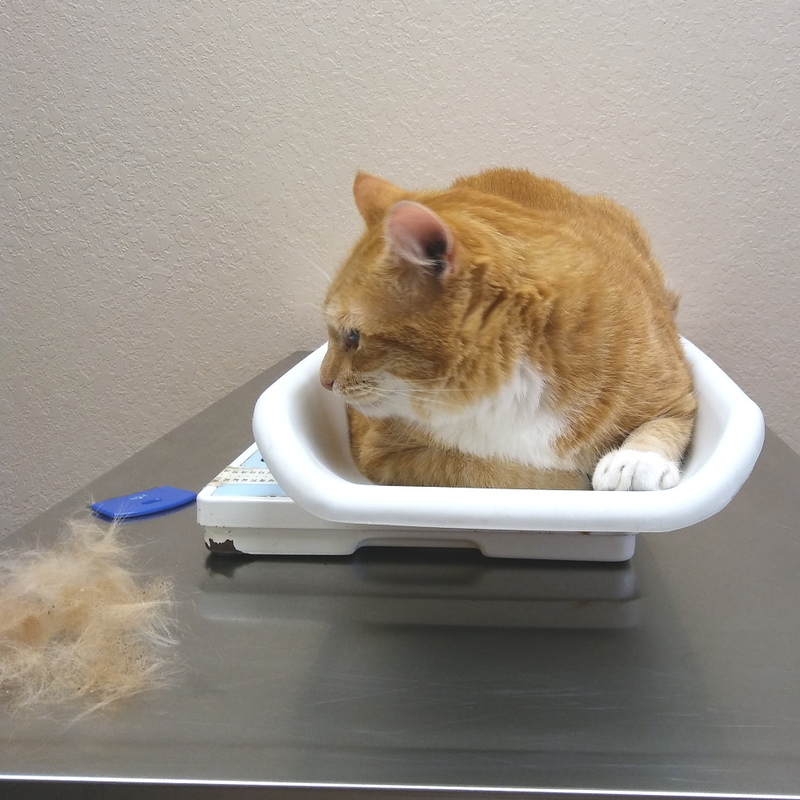 We didn’t want to hurt him by prodding so we decided to make an appointment at the vet for Saturday. On Saturday morning, I brought in the cat carrier and opened it up thinking that Chris would walk right in. He was about to do that but Frankie beat him to it. Once Frankie was out I was able to coax him inside by sticking my finger through one of the holes and making noises. I brought Chris outside and put him on Rose’s lap in my car and we drove the three minutes it took us to get to the vet. Chris didn’t seem to mind the trip. He can be an adventurer sometimes. 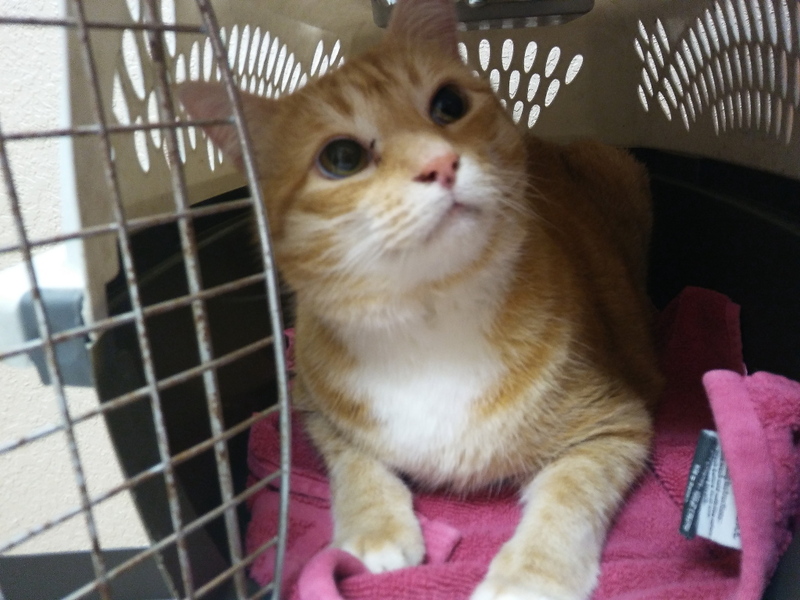 Once inside the little room at the vet’s office, I opened the cage and expected him to get out and go exploring, but he didn’t, he just stayed in the carrier. That worried me a bit because that is definitely not Chris Behavior. Normally he would be out inspecting every inch of that office. The vet tech came in and said it would be a while because an emergency walk-in had just come in. We asked her if there were any treats and she brought back a handful wrapped in a paper towel. That did the trick. I put them down in front of Chris and he was out in an instant. The vet tech came back and weighed Chris and looked at the spot we were talking about and said it looks like flea dirt. We asked, “What’s flea dirt?” She said another word is “flea poop.” She said fleas like to congregate in certain areas on a cat and one of them is the lower back. She got a flea brush and started brushing him and found two or three live fleas. 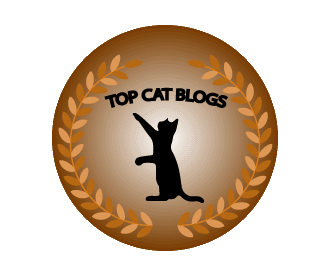 We then talked about treatment options and decided to just use the Activyl that we had already purchased but we’re behind schedule on applying to our cats. 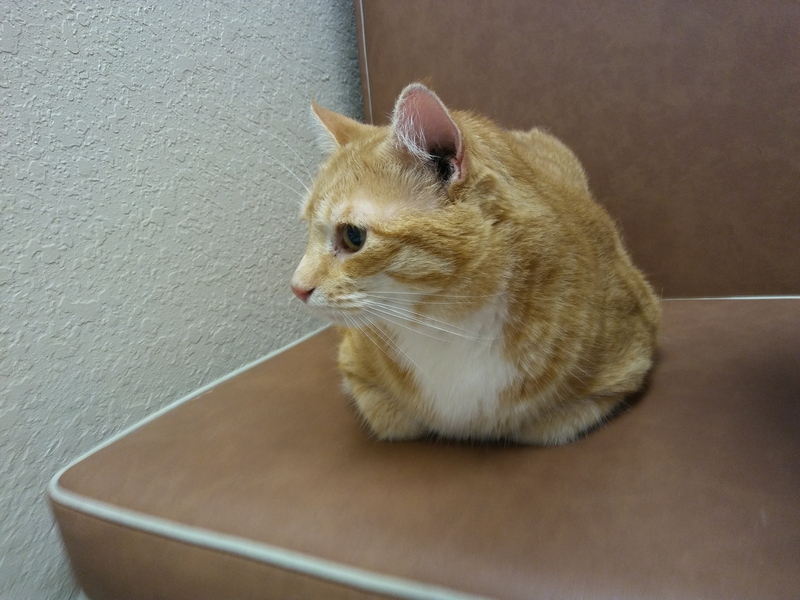 She asked if we still wanted to see the vet or should we just call it a tech visit? We said we didn’t need to see the vet now so she left and we tried to put Chris back in his carrier. He did not want to go back inside and made it very difficult for us. When we checked out they didn’t even charge us for the visit. They just charged us the $5 for the flea comb that we had bought that was totally unexpected and a pleasant surprise. We were expecting to spend another $200 at the vet. This entry was posted in Uncategorized on September 3, 2017 by Charles Huss. Thanks Pam. I hate poisoning our cats with that medication but since Frankie and Chris both occasionally go outside guess it is a necessary evil. That was nice of the vet not to charge you. When we’ve seen a vet tech, we usually get charged for that, though it’s much less than what a regular vet office visit would be. We hope the flea medication solves Chris’s issue. Fleas have been really nasty this year. Thanks. Since we know what the problem is now it should be easy to fix. Thank you. Everybody got their treatments, even Floki, who is always a hug pain to do anything to. Super glad that was all that it is! You have a wonderful office like we do, they don’t always nickel and dime us to death! Love the video of Chris, what a cutie!! You might want to get a carrier like we have, it is like yours except that it opens from the front AND from the TOP too. It’s super easy to put them in that way. They go in feet first which is a zillion times easier! I totally agree we need a better carrier, especially for Floki. I’m glad it was just fleas, and nothing else! And that you didn’t get charged for the visit. I have to have flea meds as part of being a therapy cat. Plus I do go outside on my leash sometimes. Chris and Frankie only go out once a week for a short time but I guess that is all it takes. It’s true! I’ve gotten fleas before with that little exposure. I guess it doesn’t take much. Thank you. It was a very nice thing they did. So now, I guess everybody has to get the medicine. Does the house have to be treated at all? I don’t notice any fleas in the house so, for now, I just sprinkled diatomaceous earth around all the sleeping areas. I am glad it was nothing major, but good luck with getting rid of the fleas, they are a nightmare. Thanks. Fleas really are a pain in the . . . Since my two kitty boys don’t go out (though Dougy sometimes sneaks past my legs if the door’s open…), I stopped applying the treatment for fleas. They always acted like I was dropping sulfuric acid on them, though I noticed no reaction when I once accidentally got some on my skin. (I washed it off, of course.) Chris’ experience, though makes me aware of the possibility of even an inside cat getting a flea infestation. Thanks for telling the tale! And, Chris, I’m glad the itch turned out to be something easily treated!